Please make the bear paw with scrappy Fall colors (red, yellow/gold, orange, green, brown, etc.). Background should be low volume prints that coordinate well with the Fall colors. Amy Butler, Anna Maria Horner, Denyse Schmidt but really any modern designers. Color is more important than the designer. 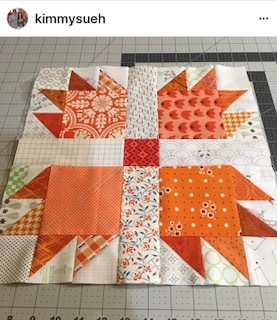 Feel free to use a 4 patch, a HST or a fussy cut square instead of the one large block in the corner of the bear paw. As long as the overall size of that square stays the same size. Wow an applaudable piece of work.. while reading I pictured some mainstream design maybe in the centre or one of the sides totbut thisally left me spell bounded.